Hypericum perforatum, known as perforate St John's-wort, common Saint John's wort and St John's wort,[note 1] is a flowering plant in the family Hypericaceae. Although used as a medicinal herb with possible antidepressant activity, high-quality clinical evidence for such effects is limited. The plant is poisonous to livestock. The primary phytochemical constituent of St John's wort is hyperforin. Perforate St John's wort is a herbaceous perennial plant with extensive, creeping rhizomes. Its reddish stems are erect and branched in the upper section, and can grow up to 1 m (3 ft 3 in) high. The stems are woody near their base and may appear jointed from leaf scars. The branches are typically clustered about a depressed base. It has opposite and stalkless leaves that are narrow and oblong in shape and 1–2 cm (0.39–0.79 in) long. Leaves borne on the branches subtend the shortened branchlets. The leaves are yellow-green in color, with scattered translucent dots of glandular tissue. The dots are conspicuous when held up to the light, giving the leaves the "perforated" appearance to which the plant's Latin name refers. The flowers measure up to 2.5 cm (0.98 in) across, have five petals and sepals, and are colored bright yellow with conspicuous black dots. The flowers appear in broad helicoid cymes at the ends of the upper branches, between late spring and early to mid summer. The cymes are leafy and bear many flowers. The pointed sepals have black glandular dots. The many stamens are united at the base into three bundles. The pollen grains are ellipsoidal. The black and lustrous seeds are rough, netted with coarse grooves. The specific epithet perforatum is Latin, referring to the perforated appearance of the plant's leaves. It is probable that Hypericum perforatum originated as a hybrid between two closely related species with subsequent doubling of chromosomes. One species is certainly a diploid a subspecies of Hypericum maculatum, either subspecies maculatum or immaculatum. Subspecies maculatum is similar in distribution and hybridizes easily with Hypericum perforatum, but subspecies immaculatum is more similar morphologically. The other parent is most likely Hypericum attenuatum as it possesses the features of Hypericum perforatum that Hypericum maculatum lacks. Though Hypericum maculatum is mostly western in its distribution across Eurasia and Hypericum attenuatum is mostly eastern, both species share distribution in Siberia, where hybridization likely took place. However, the subspecies immaculatum now only occurs in south-east Europe. The common name "St John's wort" may be used to refer to any species of the genus Hypericum. Therefore, Hypericum perforatum is sometimes called "common St John's wort" or "perforate St John's wort" to differentiate it. St John's wort is named as such because it commonly flowers, blossoms and is harvested at the time of the summer solstice in late June, around St John's Feast Day on 24 June. The herb would be hung on house and stall doors on St John's Feast day to ward off evil spirits and to safeguard against harm and sickness to man and live-stock. The genus name Hypericum is possibly derived from the Greek words hyper (above) and eikon (picture), in reference to the tradition of hanging plants over religious icons in the home during St John's Day. Hypericum perforatum is native to temperate parts of Europe and Asia, but has spread to temperate regions worldwide as a cosmopolitan invasive weed. It was introduced to North America from Europe. The flower occurs in prairies, pastures, and disturbed fields. It prefers sandy soils. St John's wort reproduces both vegetatively and sexually. It thrives in areas with either a winter- or summer-dominant rainfall pattern; however, distribution is restricted by temperatures too low for seed germination or seedling survival. Altitudes greater than 1500 m, rainfall less than 500 mm, and a daily mean temperature greater than 24 °C are considered limiting thresholds. Depending on environmental and climatic conditions, and rosette age, St John's wort will alter growth form and habit to promote survival. Summer rains are particularly effective in allowing the plant to grow vegetatively, following defoliation by insects or grazing. The seeds can persist for decades in the soil seed bank, germinating following disturbance. Although Hypericum perforatum is grown commercially in some regions of south east Europe, it is listed as a noxious weed in more than twenty countries and has introduced populations in South and North America, India, New Zealand, Australia, and South Africa. In pastures, St John's wort acts as both a toxic and invasive weed. It replaces native plant communities and forage vegetation to the extent of making productive land nonviable or becoming an invasive species in natural habitats and ecosystems. Ingestion by livestock such as horses, sheep, and cattle can cause photosensitization, central nervous system depression, spontaneous abortion or death. Effective herbicides for control of Hypericum include 2,4-D, picloram, and glyphosate. In western North America three beetles Chrysolina quadrigemina, Chrysolina hyperici and Agrilus hyperici have been introduced as biocontrol agents. Common St. John's wort has long been used in herbalism and folk medicine. It was thought to have medical properties in classical antiquity and was a standard component of theriacs, from the Mithridate of Aulus Cornelius Celsus' De Medicina (ca. 30 CE) to the Venice treacle of d'Amsterdammer Apotheek in 1686. Folk usages included oily extract ("St. John's oil") and Hypericum snaps. Hypericum perforatum is a common species and is grown commercially for use in herbalism and traditional medicine. The red, oily extract of H. perforatum has been used in the treatment of wounds for millennia, including by the Knights Hospitaller, the Order of St John, after battles in the Crusades, which is most likely where the name came from. [better source needed] Both hypericin and hyperforin are under study for their potential antibiotic properties. St. John's wort can interact in dangerous, sometimes life-threatening ways with a variety of prescribed medicines. St John's wort is generally well tolerated, but may cause gastrointestinal discomfort (such as nausea, abdominal pain, loss of appetite, and diarrhea), dizziness, confusion, fatigue, sedation, dry mouth, restlessness, and headache. The organ systems associated with adverse drug reactions to St John's wort and fluoxetine (an SSRI) have a similar incidence profile; most of these reactions involve the central nervous system. St John's wort also decreases the levels of estrogens, such as estradiol, by accelerating its metabolism, and should not be taken by women on contraceptive pills. St John's wort may cause photosensitivity. This can lead to visual sensitivity to visible and ultraviolet light and to sunburns in situations that would not normally cause them. St. John's wort can interfere with the effects of many prescription medicines, including birth control pills, cyclosporine, digoxin, HIV drugs, cancer medications including irinotecan, and warfarin. Combining both St John's wort and antidepressants could lead to increased serotonin levels causing serotonin syndrome. It should not be taken with the heart medication, ranolazine. Combining estrogen containing oral contraceptives with St John's wort can lead to decreased efficacy of the contraceptive and, potentially, unplanned pregnancies. Consumption of St. John's wort is discouraged for those with bipolar disorder. There is concern that people with bipolar depression taking St. John's wort may be at a higher risk for mania. St John's wort has been shown to cause multiple drug interactions through induction of the cytochrome P450 enzymes CYP3A4 and CYP1A2. This drug-metabolizing enzyme induction results in the increased metabolism of certain drugs, leading to decreased plasma concentration and potential clinical effect. The principal constituents thought to be responsible are hyperforin and amentoflavone. There is strong evidence that the mechanism of action of these interactions is activation of the pregnane X receptor. St John's wort has also been shown to cause drug interactions through the induction of the P-glycoprotein efflux transporter. Increased P-glycoprotein expression results in decreased absorption and increased clearance of certain drugs, leading to lower plasma concentrations and impaired clinical efficacy. For a complete list, see CYP3A4 ligands and CYP2C9 ligands. St. John's wort, similarly to other herbs, contains different chemical constituents. In large doses, St John's wort is poisonous to grazing livestock (cattle, sheep, goats, horses). Behavioural signs of poisoning are general restlessness and skin irritation. Restlessness is often indicated by pawing of the ground, headshaking, head rubbing, and occasional hindlimb weakness with knuckling over, panting, confusion, and depression. Mania and hyperactivity may also result, including running in circles until exhausted. Observations of thick wort infestations by Australian graziers include the appearance of circular patches giving hillsides a 'crop circle' appearance, it is presumed, from this phenomenon. Animals typically seek shade and have reduced appetite. Hypersensitivity to water has been noted, and convulsions may occur following a knock to the head. Although general aversion to water is noted, some may seek water for relief. Severe skin irritation is physically apparent, with reddening of non-pigmented and unprotected areas. This subsequently leads to itch and rubbing, followed by further inflammation, exudation, and scab formation. Lesions and inflammation that occur are said to resemble the conditions seen in foot and mouth disease. Sheep have been observed to have face swelling, dermatitis, and wool falling off due to rubbing. Lactating animals may cease or have reduced milk production; pregnant animals may abort. Lesions on udders are often apparent. Horses may show signs of anorexia, depression (with a comatose state), dilated pupils, and injected conjunctiva. Increased respiration and heart rate is typically observed while one of the early signs of St John's wort poisoning is an abnormal increase in body temperature. Affected animals will lose weight, or fail to gain weight; young animals are more affected than old animals. In severe cases death may occur, as a direct result of starvation, or because of secondary disease or septicaemia of lesions. Some affected animals may accidentally drown. Poor performance of suckling lambs (pigmented and non-pigmented) has been noted, suggesting a reduction in the milk production, or the transmission of a toxin in the milk. Araya and Ford (1981) explored changes in liver function and concluded there was no evidence of Hypericum-related effect on the excretory capacity of the liver, or any interference was minimal and temporary. However, evidence of liver damage in blood plasma has been found at high and long rates of dosage. Photosensitisation causes skin inflammation by a mechanism involving a pigment or photodynamic compound, which when activated by a certain wavelength of light leads to oxidation reactions in vivo. This leads to tissue lesions, particularly noticeable on and around parts of skin exposed to light. Lightly covered or poorly pigmented areas are most conspicuous. Removal of affected animals from sunlight results in reduced symptoms of poisoning. Hypericin, pseudohypericin, and hyperforin may be quantitated in plasma as confirmation of usage and to estimate the dosage. These three active substituents have plasma elimination half-lives within a range of 15–60 hours in humans. None of the three has been detected in urine specimens. The naphthodianthrones hypericin and pseudohypericin along with the phloroglucinol derivative hyperforin are thought to be among the numerous active constituents. It also contains essential oils composed mainly of sesquiterpenes. Some studies have supported the efficacy of St John's wort as a treatment for depression in humans, but have not concluded it as a replacement for more studied treatments, and proper medical consultation. A 2015 meta-analysis review concluded that it has superior efficacy to placebo in treating depression, is as effective as standard antidepressant pharmaceuticals for treating depression, and has fewer adverse effects than other antidepressants. The authors concluded that it is difficult to assign a place for St. John's wort in the treatment of depression owing to limitations in the available evidence base, including large variations in efficacy seen in trials performed in German-speaking relative to other countries. In Germany, St. John's wort may be prescribed for mild to moderate depression, especially in children and adolescents. A 2008 Cochrane review of 29 clinical trials concluded that it was superior to placebo in patients with major depression, as effective as standard antidepressants and had fewer side-effects. In the United States, St John's wort is considered a dietary supplement by the FDA, and is not regulated by the same standards as a prescription drug. 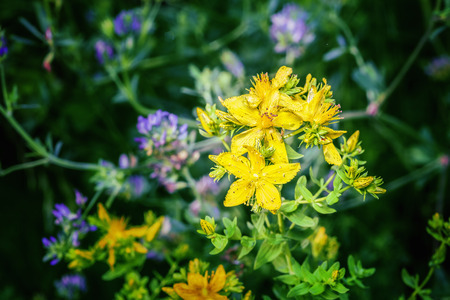 According to the United States National Center for Complementary and Integrative Health, "St. John’s wort isn’t consistently effective for depression." Supplement strength varies by manufacturer and possibly by batch. A 2016 review noted that use of St. John's wort for mild and moderate depression was better than placebo for improving depression symptoms, and comparable to antidepressant medication. In September 2016, ConsumerLab.com tested ten brands of St John's Wort supplements for levels of hypericin or hyperforin, and the presence of heavy metals, finding considerable variability in composition, with some products not containing any hypericin or hyperforin. A major constituent chemical, hyperforin, may be useful for treatment of alcoholism, although dosage, safety and efficacy have not been studied. Hyperforin has also displayed antibacterial properties against Gram-positive bacteria, although dosage, safety and efficacy have not been studied. Herbal medicine has also employed lipophilic extracts from St John's wort as a topical remedy for wounds, abrasions, burns, and muscle pain. The positive effects that have been observed are generally attributed to hyperforin due to its possible antibacterial and anti-inflammatory effects. For this reason hyperforin may be useful in the treatment of infected wounds and inflammatory skin diseases. In response to hyperforin's incorporation into a new bath oil, a study to assess potential skin irritation was conducted which found good skin tolerance of St John's wort.